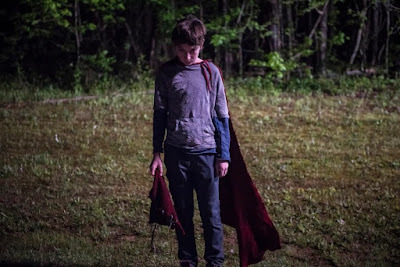 When Zack Snyder went off on his rant about Batman killing folks, maybe he should've been talking about a movie like Brightburn, because it's right up his alley. Produced by Guardians of the Galaxy's James Gunn, penned by his brothers Mark and Brian, the film is basically a horror reimagining the Superman origin story as a horror. The film stars Gunn favorite Elizabeth Banks along with David Denman and Jackson A. Dunn as the alien child who comes to Earth and is raised by a loving family in rural Kansas. But they can't control everything, and being bullied causes the child to see the world in a much darker way than Clark Kent ever did. Not to pile on Snyder in a post that isn't even about him, but Brightburn is the kind of film he should be making. If you want to tell the story of a murderous Batman character, that's fine, but you can do that without drastically changing an iconic character loved by millions. Brightburn is directed by David Yarovesky and opens on May 24th.